Amblers have redesigned the very popular FS47 and come up with the FS706 SOPHIE SHOE: Exclusively designed by Miss England bronze finalist, Sophie Lydia Smith. 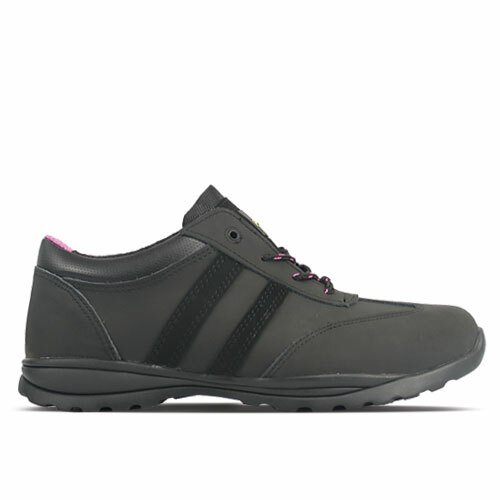 Formal black leather upper with vertical stripe overlays and optional black / pink lacing. 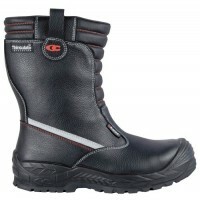 Includes steel toe cap and midsole protection. Versatile shoe applicable tobuilding surveyingmanagement, construction management, stock management, warehouse and a range of distributing industries. S1-P-HRO Toe protection tested to 200 joules impact. Antistatic. Steel Midsole Protection. Heel energy absorption 20 joules. Heat Resistant Outsole. ISO20345 tested Conforms to ISO20345 Safety Footwear Standard. Rubber Outsole Sole resistant to 300°c. Midsole - Steel Midsole (penetration resistant to 1100 Newtons). Leather Upper & Mesh Lining Hardwearing upper with comfortable padded textile lining. Padded Collar and Tongue Added comfort around the ankle. SRC Slip Resistance Tested on ceramic tile contamination with a dilute soap solution. Tested on smooth steel contamination with glycerol.